A non-rebreather mask is primarily used to deliver oxygen to treat hypoxia, wherein the arterial blood oxygen saturation is less than 90 percent. Additionally, oxygen therapy is used to alleviate symptoms associated with chest pain, sepsis, shortness of breath and fever. There are several models of non-rebreather masks available in the market with similar designs. The mask fits over the mouth and nose and elastic straps wrap around the ears or the head. A one-way valve in the mask prevents exhaled air from entering into the tubing or bag containing the oxygen that is to be inhaled. Instead, the exhaled air escapes through one way rubber stoppers in the mask. 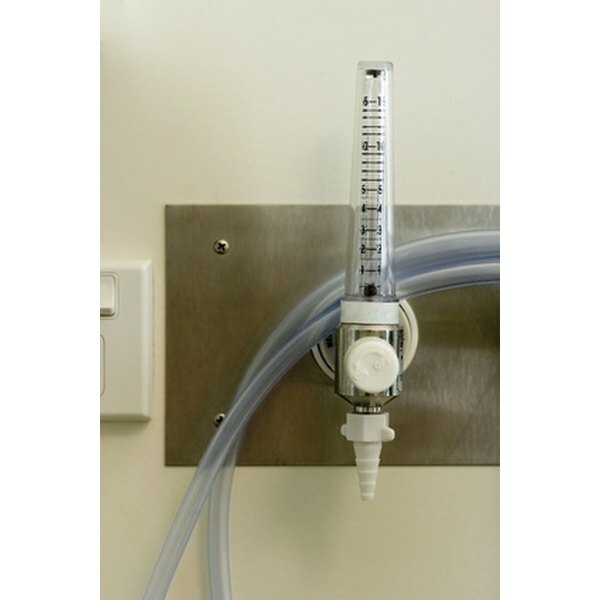 The rubber stoppers prevent the patient from inhaling any room air. When the patient inhales, the one way valve opens to allow 60 to 80 percent concentration of oxygen to be delivered. Non-rebreather masks provide an increased level of humidity to the nasal passageway, which can become inflamed and irritated with prolonged oxygen therapy. Increased humidity also increases the patient's respiratory secretions. Non-rebreather masks can feel confining and make the patient feel claustrophobic. They are difficult to keep in place on the face as they can slide off, and the elastic straps can cause skin breakdown behind the ears. The mask must be removed for many tasks including taking medications, eating and expectorating, which makes it impractical for long term use. Oxygen therapy is a medical drug intervention and should not be used unnecessarily. A non-rebreather mask is not the recommended intervention for patients with chronic obstructive pulmonary disease, or COPD. Because the fatigue and shortness of breath with COPD patients is secondary to high levels of carbon dioxide rather than decreased levels of oxygen, administering oxygen through a non-rebreather mask will cause hyperoxia, or increased oxygen levels. COPD patients with hyperoxia can experience increase dizziness and will not decrease the symptoms of COPD. Nasal cannulas are frequently more appropriate for COPD patients. Nasal cannulas are widely used throughout the medical profession to treat and control hypoxia. Unlike a rebreather mask, the nasal canula is less intrusive because it does not cover the nose and mouth. A nasal cannula wraps around the ears and delivers the oxygen into the nose via short tubes that fit into the nasal passage. Non-rebreather masks deliver two to three times the concentration of oxygen as a nasal cannula.